The Series 9 Warm Black Supermist 5 Filter from Formatt is an excellent portrait filter for someone who desires a filter that softens without making the image over diffused. 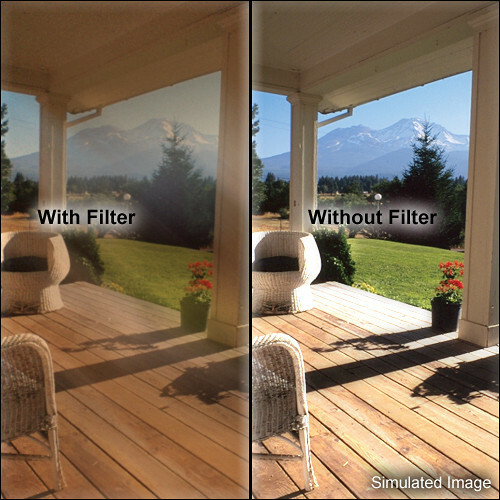 The difference between this filter and a Black Supermist is that this filter is a combination between a Clear and Black Supermist that brings a overall warmth to image. This gentle filter both reduces contrast and sharpness but not to the point where it looks overly diffused. Soft details and blemishes will be minimized and your subject will take on a flattering softness but not look like it's been extremely manipulated. The #5 Warm Black Supermist is strong. It is the warmest of the series. Contrast is minimized. Fine details are quite softened. The sharpness of your lens is reduced. However, the overall image retains a fine, detailed and pleasing look.